Today, the President once again came out front and center and killed this business project. Surely, the non-union portion of his Liberal base is celebrating this victory. But be careful what you wish for, because killing this oil pipline is only going to force the Canadians to transport this oil in more environmentally risky ways. This oil will be moved to market, and by removing the safest and cheapest transport method will merely result in this cargo traveling via other means to get to refineries. The main alternatives to moving liquids by pipeline are moving them by tanker truck, ships, barges and rail cars. This oil will most likely be sent through existing pipelines to be exported from Canada by tanker. In which case others will benefit for America's stupidity. The Merchant Mariner in me is just fine with killing off any pipeline as pipelines 'steal' cargo from tankers. Mobil Oil used to have a number of gasoline tankers bringing gasoline from Texas to the Port of New York. A pipeline put at least five tankers and their crews out of work. So you can bet that the tanker companies are not complaining about today's decision. Better yet, some of this Canadian oil may still end up at the same refineries that it was destined for via the pipeline. 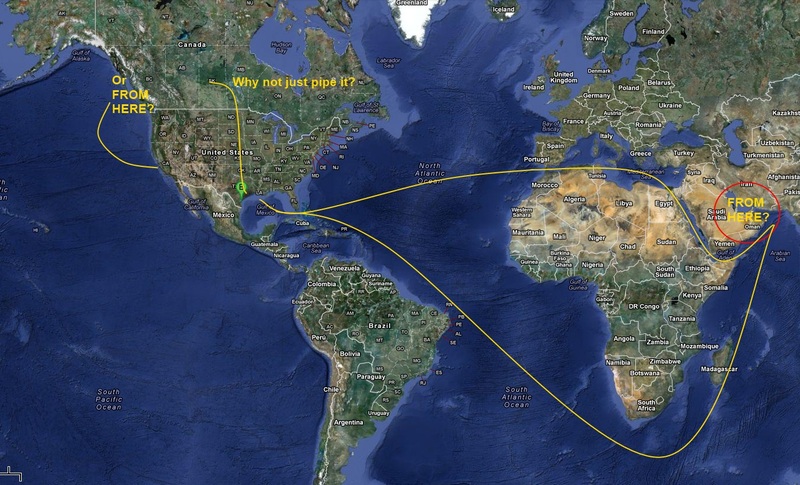 See the map below to get a reminder of how far oil from the Middle East travels to get to the US. Taking this oil from Canada is a no-brainer, even if it has to travel a more expensive, more dangerous route. Really, just how do they think we get oil pumped out of the ground in Alaska? As a reminder, the dispute is about whether a pipeline will be built. And it's not like this is a new idea. As the map below illustrates, the United States is already covered by pipelines. Then there is the Trans-Alaska Pipeline, built in one of the world's most sensitive, and environmentally brutal climates. Nor would this be the first oil pipeline from Canada either. The only reason this pipeline is having problems is because this is the first time the US Government was being run by an Administration that is both anti-business, anti-jobs and anti-oil. The President was given the opportunity to kill a project that will bring energy into the US from a friendly neighbor. Too bad we can't run our cars and heat our homes on hope. Q: Leader Pelosi, one more please. It looks like the Obama reelection campaign may criticize Congress as part of its effort. Would you feel you are being thrown under the bus if they do that? And don't forget the video of 'Ryan' pushing Granny over the cliff in her wheelchair. Of course they are doing this to paint the Republicans as the ones who are killing off Medicare. Strangely enough, they do this by resisting any reform that might prevent the system from going bankrupt. I'm left with Romney and McCain. My first thought is to write in Thompson. No, that's not right. Not unless there is some sort of massive write-in organized, and that will never happen. So I guess I will vote for Romney. Now I just need to get excited about it. Well it will be excitement enough if he beats whoever the Democrats push forward. And when that happens, there will be no shortage of lost marbles on the left. That has to be worth a good laugh.